Tram schedule 1980. Changes 1970 - 1979.
route 42 changed to run Madách Imre tér - Kispest, Tóth Árpád utca. route 65 shortened Rákospalota, Széchényi tér - Pestújhely MÁV telep. 03. 05. route 9 shortened Albertfalva kitérõ - Lánchíd. route 9A changed to run Albertfalva kitérõ - Móricz Zsigmond körtér között jár. 07. 03. route 57 introduced between Csörsz u. - Moszkva tér - Császár fürdõ. the terminal of routes 4, 4A, 11, 17 and 18 temporarily moved from Margit híd to Császár fürdõ. 01. 03. route 60 withdrawn. 23. 12. route 44 shortened to run Keleti pu. - Zugló, Rákospatak. route 68 introduced at night. 31. 12. route 68 shortened to run Keleti pu. - Örs vezér tere. route 19 changed to run Batthyány tér - Kelenföldi pu. route 9 extended to run Batthyány tér - Budafok, Városház tér. route 4 changed to run Moszkva tér - Fehérvári út. route 18 changed to run Szent János kórház - Albertfalva kitérõ. route 47 extended to run Nyugati pu. - Budafok, Városház tér. route 63 changed to run Nagyvárad tér - Madách tér. route 41 shortened to run Budafok forgalmitelep - Budaörs. route 43 and 43A shortened to run to Budafok, Városház tér. the terminal of routes 11 and 17 removed to Margit-híd. 12. 08. route 31É changed to run Ferenc krt. - Mester u. - Pacsirtatelep. 17. 10. route 31 shortened to run Közvágóhíd - Pacsirtatelep. 14. 11. route 2 extended to run Közvágóhíd - Jászai Mari tér. 15. 11. route 2A introduced between Boráros tér - Jászai Mari tér. 29. 12. route 69 introduced between Kacsóh Pongrác út - Újpalota, Erdõkerülõ u. között. 04. 10. Tram traffic withdrawn from Baross utca (20. district), routes 13, 31, 32i now serve Török Flóris utca. route 13 and 32i eextended to Pacsirtatelep. 01. 09. route 14 shortened to run Nyugati pu. - Angyalföld forgalmitelep között jár. ??. 12. type of route 12 converted to 2UV+trailer. ??? route 20 shortened to run Ferenc krt. - Üllõi út. route 23 shortened to run Keleti pu. - Üllõi út. route 23A introduced between Közvágóhíd - Üllõi út. 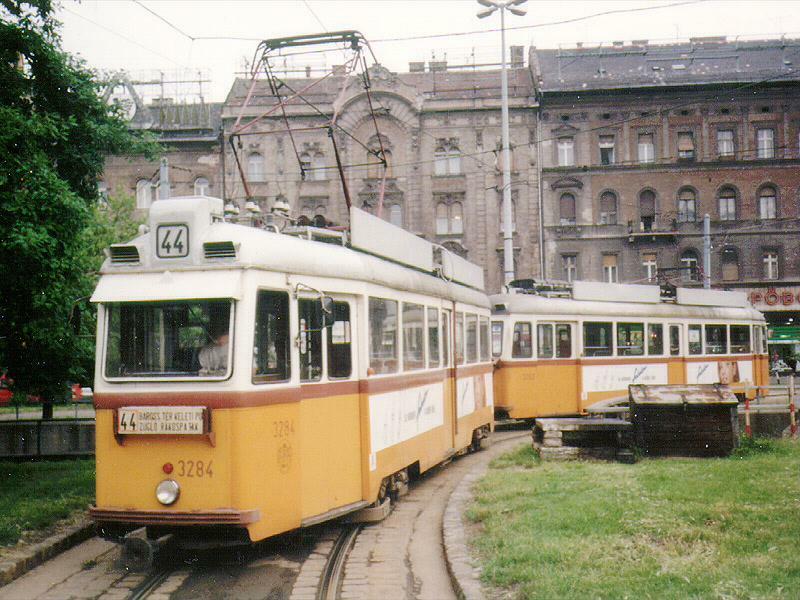 route 42 shortened to run Nagyvárad tér - Kispest, Tóth Árpád utca. route 20 reinstated between Ferenc krt. - Golgota út. route 23 reinstated Közvágóhíd - Keleti pu..
01. 07. route 50A withdrawn. route 41 shortened to run Budafok forgalmitelep - Kamaraerdõ. 15. 12. type of route 30 converted to 2UV+trailer (instead of 2950 and 3050). 23. 12. type of route 31 converted to 2UV+trailer. 02. 01. route 50A reintroduced. type of route 44 converted to Ganz. 28. 04. Gradual conversion of routes 4 and 6 to coupled Ganz Artic sets (instead of 2UV+p), completed by 12. 05. 12. 05. type of route 44 converted to 2UV+p. 06. 03. 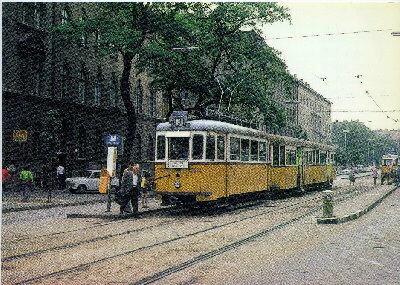 Tram traffic withdrawn from Ady Endre utca (20. district) between Határ út - Nagysándor József utca. 01. 08. route 42 temporarily withdrawn. 13. 01. withdrawn route 65. Ecseri út  Nagykõrösi út  Használtcikk piac. route 42 shorter: Kispest, Határ út  Ady Endre út  Tóth Árpád utca. route 50 shorter: Kispest, Határ út  Üllõi út  Pestszentlõrinc, Béke tér. route 51 shorter: Használtcikk piac  Pestszentimre, városközpont között jár. withdrawn route 50A (Nagyvárad tér  Kispest, Villanytelep). withdrawn route 51A (Nagyvárad tér  Használtcikk piac). 01. 04. type change on route 23: 2UV+p (instead 2000 and 2500 twin cars). 16. 06. new type on route 14: 2 T5C5. Bajcsy-Zsilinszky út until 16. 10. because of the reconstruction of the Szabadság híd. 01. 07. open route 50A: Kispest, Határ út  Üllõi út  Kispest, Villanytelep (2UV+p). 30. 07. type change on route 67: 2UV+p (instead 1500+5800).  Szabadság híd  Bartók Béla út  Fehérvári út  Leányka utca  Budafok, Városház tér. 31. 12. route 8 withdrawn (Újpest, Szent István tér  Baross u.  Megyeri út). 01. 01. type change on route 30: 2 UV-ra (instead 2UV+p). 04. 01.open route 52A: Kispest, Határ út  Határ út  Gubacsi út (2 UV). 08. 01. type change on route 23: 2 UV (instead 2UV+p). 17. 01. route 11 withdrawn. 17. 01. route 33 withdrawn. 19. 01. route 17 longer: Margit híd  Frankel Leó út  Bécsi út  Vörösvári út. 31. 03. route 3 shorter: Árpád híd  Váci út  Újpest, Fóti út. Szilágyi utca  Pozsonyi utca  Rákospalota, Kossuth utca. 01. 04. route 14 changes: Lehel tér  Lehel utca  Béke utca  István út  Újpest, Szent István tér. 03. 05. route 3 withdrawn. 03. 05. route 55 withdrawn. Ecseri út  Határ út  Török Flóris utca  Nagysándor József utca..
06. 07. route 51 withdrawn. 25. 11. new type on route 56: 2 T5C5-re (instead 1000). Ecseri út  Határ út  Gubacsi út. 27. 11. route 52A withdrawn. 01. 12. route 43 withdrawn (Budafok, Városház tér  Nagytétényi út  Nagytétény). 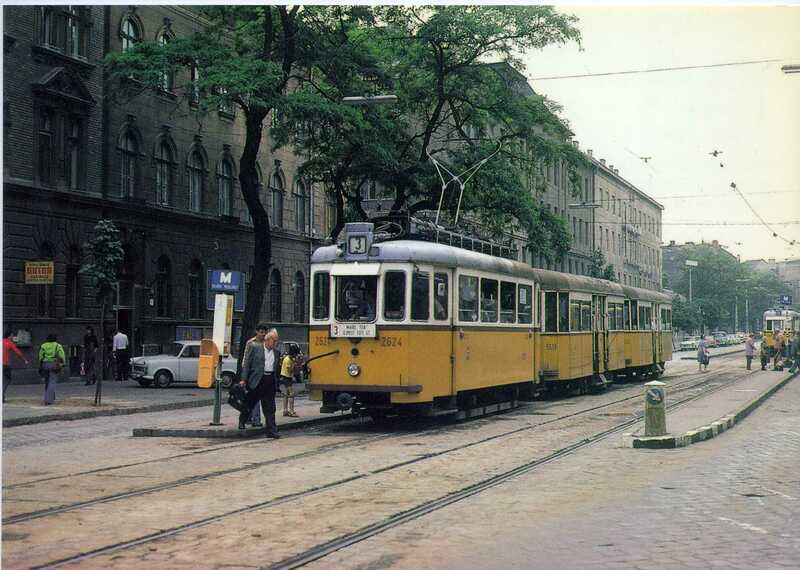 Leányka utca  Budafok, Városház tér. 01. 08. new type on route 28: 2 T5C5-re. 01. 09. new type on route 41: 2 T5C5-re (instead 1000). 01. 09. new type on route 10: 2 T5C5-re (instead 1000). 01. 01. route 47É withdrawn. 28. 04. there is no traffic on route 50A because of reconstruction until 01. 08. 31. 05. route 10 withdrawn. 04. 05. type change on route 44: 2 UV (instead 2UV+p). 01. 09. type change on route 50A: 2 UV-ra (instead 2UV+p). Fehérvári út  Leányka u.  Mária Terézia u.  Budafok, Városház tér; 2UV+p). 15. 12. route 14 longer: Lehel tér  Káposztásmegyer, Szilas-patak között jár. 21. 07. route 1 longer: Bécsi út  Kacsóh Pongrác út. 01. 09. there is no traffic on route 6 in the night. ??? type change on route 19: 2 UV (instead 2UV+p). 01. 07. route 1 longer: Bécsi út  Thököly út. 15. 10. It is obligate to use dipped headlights also by daylight on the tramcars. István út  Angyalföld, forgalmitelep (3 T5C5). 02. 01. type change on route 11: 2 T5C5 (instead 3 T5C5). 01. 01. route 37 shorter early mornings and late evenings: Kozma utca  Blaha Lujza tér. 30. 05. route 41 longer: Móricz Zsigmond körtér  Fehérvári út  Ady Endre út  Kamaraerdõ. 12. 10. route 1 longer: Bécsi út  Kerepesi út. 26. 11. there is no traffic on route 31 in the night. 19. 12. route 30 temporary withdrawn. 19. 12. route 31 shorter: Közvágóhíd  Pesterzsébet, Szabótelep. 01. 01. the shorter 37 get the sign 37A early mornings and late evenings. 01. 09. route 36 withdrawn (2 T5C5). 24. 11. reopen and longer route 30: Ferenc körút  Pesterzsébet, Pacsirtatelep (2 UV). 02. 01. route 50A withdrawn. 17. 07. route 1 longer: Bécsi út  Salgótarjáni utca. 24. 07. route 31 withdrawn (2 UV, MUV). 29. 07. route 37 shorter: Blaha Lujza tér  Új köztemetõ, Izraelita temetõ. 23. 12. route 11 withdrawn. 25. 12. route 44 withdrawn. 01. 03. there is no traffic on route 50 in the night. 01. 03. there is no traffic on route 28 in the night. 31. 03. tram depot Óbuda is closed. 01. 04. route 49É withdrawn. 15. 06. route 37A temporary withdrawn. 15. 11. there is no freight transport on the tram lines. 11. 03. there is a bus line 67V instead route 67. 11. 03. open route 69A: Mexikói út  Rákospalota, MÁV-telep (2 UV). 30. 09. there is no traffic on route 14 in the night. 01. 10. route 69A withdrawn. 18. 10. route 28 and 37 longer again. 18. 10. reopen route 37A. 31. 07. route 14 longer: Lehel tér - Káposztásmegyer, Megyeri út.